1. The total hereditary determinants of an individual, comprising both chromosomal and extrachromosomal factors. 2. The molecular arrangement of amino acids unique to the antigen-binding site of a particular antibody. A type of animal, or plant, the lack of which is characteristic of a specified region. A type that contains two or more letters cast as one piece. A plant, or animal, resembling in many respects another one from which it is systematically distinct and geographically isolated. 1. A trademark for a typesetting machine run from a keyboard that activates a unit that sets type by individual characters. 2. A plant, or animal, that is the only member of the taxonomic category to which it belongs. 3. A unique printed image or an artwork created by pressing on paper laid on an inked metal plate or sheet of glass. Although similar prints can be made, each one will be unique. The part of the oviduct of certain trematode (parasitic) worms in which the ova are completed and furnished with a shell. 1. The style of type used on an eye chart. 2. A standardized symbol for testing vision. 3. Types used to determine visual acuity when different sizes are presented to a person and the smallest size the person can reliably identify determines the person's level of achievement. A genotype as originally designated. The arrangement and appearance of printed letters or ancient printing: The evolution of three paleontypographies or classical languages; including, Phoenician, Greek, and Roman. The Phoenician alphabet was perhaps the first alphabetic script to be widely-used because the Phoenicians traded around the geographical area of the Mediterranean and beyond while they established cities and colonies in parts of southern Europe and North Africa. 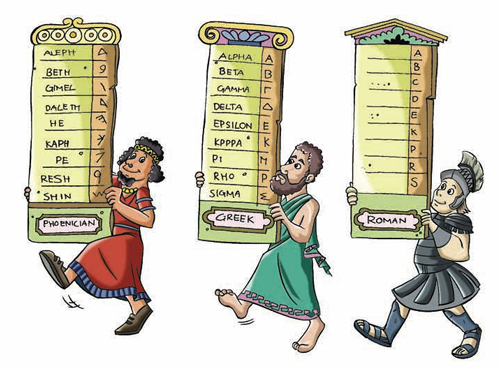 The origins of most alphabetic writing systems can be traced back to the Phoenician alphabet, including Greek, Etruscan, Latin, Arabic and Hebrew; as well as the scripts of India and East Asia. Direction of writing is from the right to the left in horizontal lines: aleph to tow; as shown in the chart below. The writing system is abjad, a consonant alphabet with no indication of vowels. The number of letters is twenty-two; however, there were variations in their forms in different regions and at different times. The names of the letters are acrophonic, relating to the use of symbols to represent sounds, and their names and shapes can be traced back to Egyptian Hieroglyphs; for example, the name of the first letter, aleph, means ox which was developed from a picture of an ox's head. Some of the letter names were changed by the Phoenicians, including gimel, which meant camel in Phoenician, but was originally a picture of a throwing stick or a giml. of writing systems and languages; plus other Google.com sources. Here are the Phoenician symbols or letters. Click on this Greek and Related Roman Alphabets page for more information. 1. The sum total of observable structural and functional properties of an organism. 2. The physical appearance of an organism as distinguished from its genetic makeup. The phenotype of an organism depends on which genes are dominant and on the interaction between the genes and the environment. Relating to, or characteristic of an individual organism. A graphic symbol representing a speech sound; such as, in printed texts. Showing page 3 out of 7 pages of 97 main-word entries or main-word-entry groups.